Somehow we missed this one when it was announced. Olympus released two new compact cameras recently, in the Tough range was the TG-810 which is crush proof, waterproof, etc and has a GPS. Of more particular interest for me is the new SZ-30MR which shows the face of the future for cameras that do still and video. The SZ-30MR is capable of not only capturing 1080p Video but also 16MP still images simultaneously. Check out the full press release when you read on. New! Eye-Fi™ Card Compatibility – enables automatic wireless uploading of images to the website or PC of your choice. The SZ-30MR records gorgeous full-resolution, 1080p HD video and 16-megapixel stills at the same time. Thanks to an ingenious feature called Multi-Recording, you’ll never have to choose between video and stills again. The camera’s dual TruePic III+ Image processor makes it possible to record simultaneously in more than one mode and in a variety of combinations. Users can record two different movies at once: in wide-angle and close-up; full HD and lower resolution or original and filtered (using one of the SZ-30MR’s seven Magic Filters for movies). In addition, with the Photo with Movie Clip setting, it’s now possible to capture moving footage before and after taking a single photo. These new innovations give users the fun and flexibility of sharing their shots in a variety of media – from full-size prints of a birthday party or wedding to video clips for uploading to their favorite social media website. Whether you are globetrotting or attending a sporting event, the Olympus SZ-30MR lives up to its name with a 24x wide-optical zoom, yielding a 25-600mm zoom equivalent in 35mm format. With this zoom power, it’s easy to take exceptional close-up shots of the athletes on the field. The Olympus SZ-30MR has a 16-megapixel backlit CMOS sensor, enabling consumers to achieve consistently sharp and vivid images with higher sensitivity and lower noise for producing large-format prints or cropping/enlarging a portion of a photograph. The backlit CMOS sensor is perfect for capturing low-light shots. The Olympus SZ-30MR also incorporates a Handheld Starlight Mode, enabling you to shoot blur-free, beautiful night scenes while holding the camera in your hands, without the need for a tripod. The Olympus SZ-30MR shoots stunning 1080p HD video, so you’ll always capture the action. Playback on your HDTV is also a breeze. You’ll be the hit of the party or any family function when you proudly display your brilliant images and videos on HDTV. Simply connect the camera to an HDTV with an HDMI™ cable, which can be purchased separately at any consumer electronics store. With HDMI Control, you can use your HDTV’s remote to control playback functions and navigate the camera’s menus from the comfort of your favorite couch. The Olympus SZ-30MR is capable of capturing images at an incredible 9 frames per second in full 16-megapixel resolution so you’ll capture the smallest details. This is perfect for situations where timing is essential, such as photographing a tennis player serving, children playing or capturing a hawk swooping in for dinner. The Olympus SZ-30MR is equipped with in-camera Magic Art Filters that enable users to enhance and customize both images and videos as they’re being captured. Have more fun and get more flexibility without expensive and time-consuming computer software. Magic Filter Movie is a new feature that enables you to apply Magic Art Filters to your high-definition videos, taking them to a new level of artistic expression. The Multi-Recording Function also allows photographers to simultaneously capture a Magic Filter movie and one without Magic Filter applied to it. New! Punk – create two-tone images full of rock-and-roll spirit. Now you can add even more dimension to your photographs by shooting dynamic 3D photos in any mode from macro to landscape. Recreate a sense of depth like that of the original scene. Simply select the 3D Photo shooting mode, release the shutter for your first shot, slowly pan until the camera automatically takes a second image from a slightly different perspective. The 3D data is processed in-camera resulting in an .MPO file, the universal industry 3D format for easy display on 3D televisions or laptops. Ready to upload and share your party images live as they happen? The Olympus SZ-30MR is compatible with an optional Eye-Fi SD card, adding Wi-Fi capability so you can automatically upload images to a computer as you take them. Be the life of the social media party by uploading your shots moments after they happen. If you’re going to an evening at the theatre, the SZ-30MR also offers Dual Image Stabilization to further assure you’ll get the shot you want while holding the camera. Mechanical Sensor-Shift Image Stabilization compensates for camera movement in low-light conditions when shutter speeds are slower while Digital Image Stabilization freezes the action with high ISO sensitivity and fast shutter speeds that prevent blurry images often caused by a moving subject. The SZ-30MR also comes equipped with ISO sensitivity to 3200 so you can take sharp, full-resolution photos in dark places. The camera’s iAuto mode automatically detects low-light scenes and adjusts the ISO accordingly for the best image quality. The places you can take the Olympus SZ-30MR —national parks, weddings, sporting events or city streets—are locations where you want to capture as much of the scene as you can. In-Camera Smart Panorama mode makes it possible by simply pressing the shutter button and slowly panning across the scene. The camera does the rest of the work for you, creating a dynamic panorama. Olympus developed its exclusive TruePic III+ Image Processor for the demanding performance of DSLRs and has migrated the technology to the S-series cameras for amazing image quality. The Dual TruePic III+ Image processor incorporates two image processors working in parallel to allow photographers to capture stills and HD videos at the same time. Olympus’ enhanced TruePic III+ Image Processor produces crystal clear photos using all the pixel information for each photo to deliver exceptional clarity with more accurate colors, true-to-life flesh tones and faster processing speeds. TruePic III+ also captures crisp, clear photos at high ISO settings, which are traditionally associated with increasing noise or producing grainy photos. Taking beautiful portraits at a wedding or family reunion is easy with Olympus SZ-30MR’s Beauty Mode. Designed to touch up the appearance of your subject’s skin as the photo is captured, this feature enables you to soften shadows and smooth wrinkles or blemishes on your subject’s face – all in the camera and as you capture the image! Additionally, subtle edits can be made post-capture using the Beauty Fix mode. Have fun customizing your brilliant images without a PC and costly image editing software. AF Tracking technology locks focus on your fast-moving subject – everything from house cats to Siberian tigers – and continuously adjusts focus and brightness. This enables you to keep quick-moving and unpredictable subjects like kids and pets in focus for the perfect shot. Taking a moonlit stroll on the beach? Intelligent Auto Mode automatically identifies what you are shooting (i.e., Portrait, Night + Portrait, Landscape, Macro or Sports) and adjusts the camera’s settings to capture the best quality results. Quick and hassle-free, this feature does the thinking for you to produce incredible images. Shooting outdoors in bright daylight can be tricky because of the extreme contrast between dark shadowed areas and bright sunlight areas. While the human eye is capable of detecting the nuances between dark and light and all the details in between, image sensors traditionally have not been quite as sensitive. The Olympus SZ-30MR addresses this challenge head-on with Shadow Adjustment Technology, which compensates for extreme contrast where the shadow areas are underexposed and lack visible detail. With this technology, users can preview and capture images that have the same contrast as seen with the naked eye. The new S-series cameras have scene modes and enhanced In-Camera Help Guides that make digital photography simple and fun for users of all ages and skill levels. The scene modes include portrait to capture loved ones, landscape to show off the scenery and a fun fireworks mode. There’s even two newly designed “Pet Modes” for animal lovers, offering the ability to recognize the faces of a variety of breeds of both cats and dogs. The In-Camera Help Guide displays a brief description of camera settings and features on the LCD. Additionally, Exposure Compensation enables users to preview and select various exposure effects on a live, multi-frame window on the LCD before snapping the shot. This smart feature enables users to see precisely what the image will look like when adjustments are made, ensuring they are capturing the exact image desired. Program Auto and Exposure Compensation are great modes that enable users to get results like the pros while learning about the effects of different photography techniques. Menus are available in various languages for convenient operation. With SD compatibility, the Olympus SZ-30MR allows users to share their work easily through SD-compatible computers, digital picture frames and HDTVs. 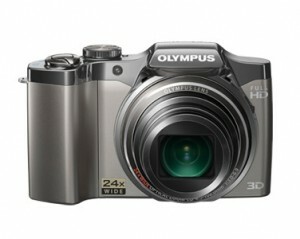 The Olympus SZ-30MR will be available in April 2011. It will ship with a Lithium-Ion Battery, USB Cable, Wrist Strap, Quick Start Guide, Warranty Card, Instruction Manual, OLYMPUS [ib] and Olympus Viewer 2 Software. * Specifications and design are subject to change without any notice or obligation on the part of the manufacturer. All trademarks and registered trademarks listed herein are the property of their respective holders, in the US and/or other countries. **Sparkle is available for still image capture only. Announcement: PhotoComment Magazine goes on Sale from October 2012.